Senior Buddhists have called on world leaders to agree a new climate change agreement at a conference in Paris next month. The 15 signatories, including the Dalai Lama, are urging politicians to completely phase out fossil fuels. They argue that the rise in global temperatures must be limited to 1.5C in the future. 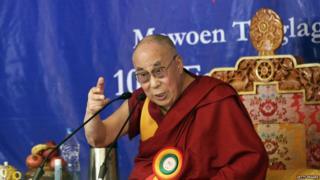 Observers say it is the first time that so many leading Buddhists have joined together on a global issue. The statement from the leaders of over a billion Buddhists worldwide says that the causes of this "environmental crisis" are the use of fossil fuels, unsustainable consumption patterns, lack of awareness and lack of concern about the consequences of our actions. The leaders urge negotiators to use "wisdom and compassion" to find an agreement at the Conference of the Parties in the French capital at the end of November. "We are at a crucial crossroads where our survival and that of other species is at stake as a result of our actions," the statement says, arguing that the world must move to 100% renewable and clean energy. The leaders call for a deal in Paris that will limit the rise in global temperatures to 1.5C above pre-industrial levels. This will encourage the many small island states who are pressing for 1.5 degree target with the view that anything beyond that may make their homes uninhabitable as seas rise in response to warming. "Everyday life can easily lead us to forget that we are inextricably linked to the natural world through every breath we take, the water we drink and the food we eat," said Lama Lobzang, secretary of the International Buddhist Confederation. "Humanity must act on the root causes of this crisis, which is driven by greed, thoughtlessness and a lack of concern about the consequences of our actions." The Buddhist intervention comes in the wake of similar statements of concern about climate change from Catholic and Muslim leaders. In their call, the Buddhists leaders say the welcome and support these declarations.